The BCA League came to Erie in 2006. The 2016-17 season is the eleventh year for the league. The format is designed to appeal to the dedicated player who wants to play a lot of pool on league night. Matches are played on 7’ bar-tables and 9′ regulation tables. A match takes place on 2 tables. Teams are comprised of 5 players. 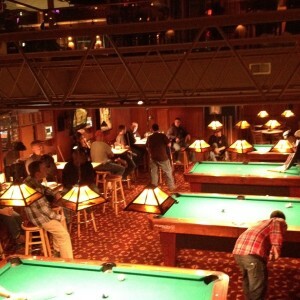 Each player plays 1 game of eight-ball against every player from the opposing team totaling 5 games a night. The league is played on Wednesday evenings and lasts 16 weeks starting in the Fall and concluding in the Spring. A simple and unique system invented by Paul Schofield is used to rate players. Players are rated by how well they play and not by how often they win or who they win or lose to. The handicap system uses the player rating system to make the league highly competitive and the standings much tighter than what is normally expected. For the sixth year, the league employs the “No Conflict Rules” for racking and breaking. The rules remove much of the luck and frustration that typically surround the front end of short games. The league standings and stats will be updated weekly at the links below. League night at the Crown.